Or you’ll get zero marks! Or you’ll get zero marks. Don’t type it out yourself! Or Viderman will have spaz! 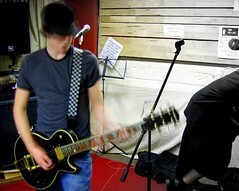 Last night I sat in on a pre-gig rehersal for a friend’s band, Static Vendetta. Considering that my own band isn’t exactly in the best shape it’s ever been in, watching Static Vendetta practice is elightening. To start with, they play as a definate unit. The band is led by the drums, which are imaginative, varied, powerful, and – critically – consistant. The band takes their timing from the drums – this is the way that it should be. In The Lowlifes, songs have a tendency to rely on either me or Elliot for timings as we use an electric kit (it’s all we can fit in the attic), and they’re quiet.